With just 1,191 nautical miles (nm) to run to the finish for leg leader Telefónica (Iker Martínez/ESP), the miles are clicking down dramatically as the two of the three boats still racing in Leg 1 of the Volvo Ocean Race hit high speeds riding a South Atlantic cold front. The speeds of up to 28 knots will continue as the wind increases during the next 12 hours, but the numbers are still shy of the monohull world 24-hour distance record. 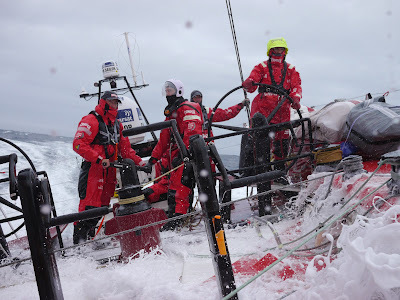 Presently the leaders have around 25 knots of breeze and they will continue to ride the front until early evening tonight when they will be expected to gybe onto starboard and begin their approach to Cape Town for a finish overnight on Saturday. In second place, CAMPER (Chris Nicholson/AUS) is making good progress, although they will not benefit from the cold front as much as Telefónica. The boat has averaged some good speeds of around 22 knots and at one point overnight covered 96 miles in four hours. The team is still between 10 and 20 hours and 107 nautical miles (nm) behind the leader. Groupama 4 (Franck Cammas/FRA) is secure in third place and continues to take the more direct northern track, 336 nm behind Telefónica. This doesn’t come without risks of its own, but rather than face boat-breaking conditions, the French team has to run the gauntlet with the centre of the St Helena High and must judge carefully how close to it they dare to sail in their attempt to cut short the distance to Cape Town. Even the quickest route does not show the team finishing before Tuesday morning at the earliest. It’s fast and furious sailing out on the racetrack today as temperatures drop and a fire hose torrent of freezing water is continuously dousing the crews on deck, but the finish in Cape Town is now on the horizon and the promise of good food and a dry bed is keeping the crews focussed in the final stages.